Winter is a time of stress for many homeowners. The risk of frozen pipes, ice dams, and other snow-related problems are always a risk. Yet there is one type of winter weather you might not have given much thought to – hail. Unlike snow, hail attacks your home as chunks of ice, varying in both size and velocity. Your windows are the most obvious risk during a hailstorm, but it can also damage your roof. This can mean costly repairs, especially if you don’t catch the damage early. 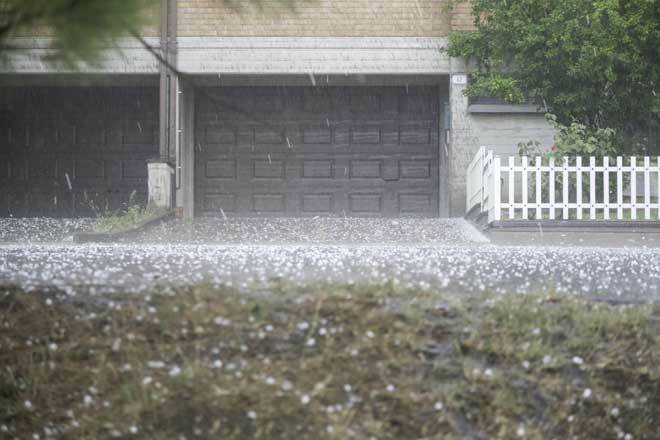 Hail of any size can cause damage depending upon the condition of the roof and the speed at which the hail stones impact. Metal roofs are the most resilient, while asphalt are the least. The following size guidelines give a rough indication of what damage you might expect. While usually non-threatening, hail as small as a dime can tear already damaged asphalt shingles. Old shingles may also be damaged. Even at high velocity, such small hail stones are unlikely to cause harm to new shingles or harder roofing materials. Hail ranging between a dime and quarter in size may not do significant damage, but they can wear away your roof and speed up erosion. There is also a greater chance of breaking slate or tearing asphalt if those materials are already damaged. Higher speeds increase the chance of impact damage. 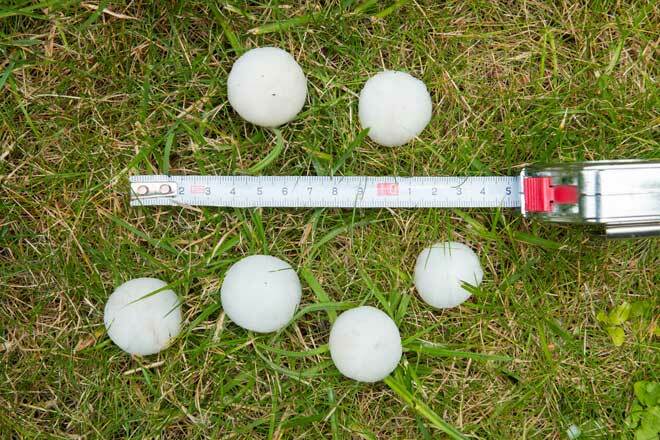 Any hail which is larger than a quarter poses a significant risk to your roof. These are big enough to damage shingles, and at high impact speeds can also break slate tile or dent metal roofs. You should always check for damage after a storm with hail of this size. 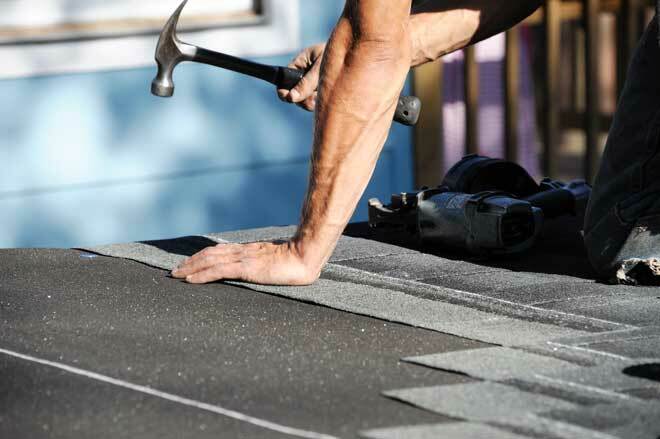 There are a wide variety of materials used for roofing, many of which share certain qualities. Unfortunately, different types of tile may show different signs of damage, making it important to consider the covering on your roof. Most materials may be grouped under three main types: asphalt/shingle, slate/ceramic, and metal. After a storm, be sure to check the area around your home for any telltale signs. Damage to your fence, gutters, or shed strongly suggest your roof has also been harmed. Fragments of your roof on the ground are also a clear indication. 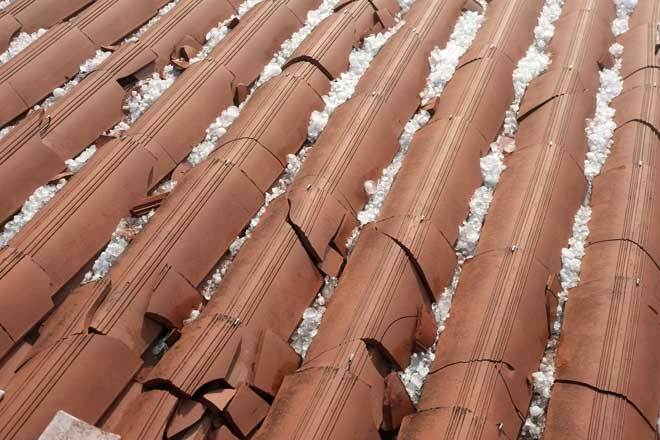 Don’t wait for a leak if you suspect your roof has been damaged. Flashing, vents, and other metal components of your roof give their own telltale signs of hail damage. Dents, scratches, and small holes which appear after a hail storm suggest there is also damage to the rest of the roof. Check the downspouts and gutters for signs of granules that may have been dislodged from your roof. These will be especially noticeable if the direction of hail was facing one side of the roof. 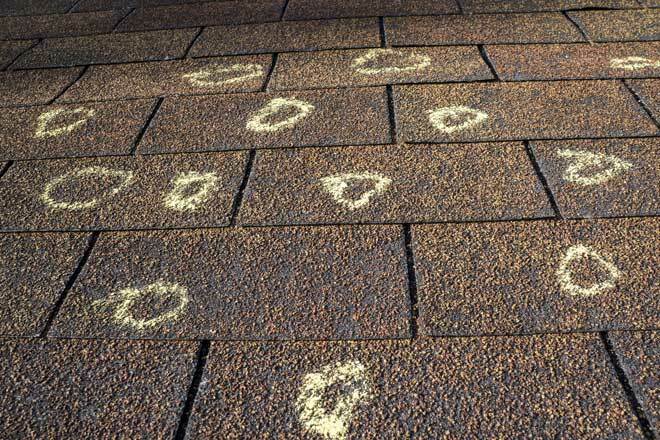 While not necessarily caused by the hail itself, dislodged granules are an indicator of damage to the shingles. When a large number of granules are present, check the shingles above for bare spots where the asphalt substrate is visible. Check shingles for signs of round or oval dents in the shingles. There may also be some other forms of pitting caused by hail impact. Mark any shingles which have cracks, visible substrate, and pitting. While the latter is less urgent, taking pictures which show all damage will be more beneficial for an insurance claim. Clean, sharp-edged holes are a clear sign that hail has pierced the tiles. Small punctures and cracks caused by impacts can weaken the tiles, regardless of how deep they are. Shattered, cracked, or otherwise destroyed tiles after a hail storm will require immediate attention to avoid structural damage from further weather. Chipped or broken corners and edges are often considered additional evidence of hail damage. Scour Marks – These scratches appear after hail has impacted at an angle, scraping away the protective outer coating. Dents – Much like your car, the metal on a roof can be dented or pockmarked by hail. The size and depth of these marks depend upon the size and speed of the impacting hail stones. If you are unsure of damage or do not feel comfortable examining the roof personally, you may wish to contact a professional to survey for damage. These inspections are free, and you should make it clear that you are not requesting repairs at this time. Roofing professionals know what to look for and may be better able to document any problems for your insurance company. While not necessary, an expert’s eyes may find trouble areas you’ve overlooked, especially if you are facing hefty repair costs. Be warned not to sign any documents such as contingency contracts or inspection reports, as these may contain fine print requiring you to employ that contractor or company for repairs or face cancellation fees. When there are obvious signs of hail damage, you may wish to file a claim with your insurance company to cover the costs of repair. Filing is generally a three-step process, and the more information you are able to provide, the faster the process will be. Be sure to keep your claim number somewhere safe so that you can refer to it as needed. Once all of the evidence has been weighed, your insurance company will send a claims adjuster to examine the roof personally. He may come alone or bring a team if your roof is particularly steep. Be sure to provide copies of your photos and other documents to the adjuster. This can save time and effort by allowing the adjuster to pinpoint known trouble spots. In the event you hired a professional to examine the roof, arranging to have them meet up with a representative of your insurance company to discuss their findings may increase your chances of being approved. The inspection will involve photographing damage, as well as measuring out ten foot square sections of your roof and counting the number and density of impacts. These impacts will all be outlined in chalk before photographing for easier reference. A report and estimate is then made for spot repairs or full roof replacement and presented to your claims examiner for a final ruling. Clear signs of damage should be addressed, even if there is no leak at the present time. Dents, cracks, and other problems may weaken your roof’s outer layer and lead to problems down the line. This is especially true of shingles, which can turn from repellent to absorbent if the coating is destroyed. Before deciding on a plan of action, there are a few factors to consider. These may not only affect the cost of repairs, but also the risk involved. Budget: Depending upon the amount of damage and the results of your insurance claim, it might be cheaper to do the repairs yourself. Conversely, your insurance provider may require you to hire a professional before awarding you the maximum payout. Roofing Material: If you plan to repair the roof yourself, make sure you have the proper equipment and some working knowledge. Asphalt shingles are the easiest to repair, but under no circumstances should you attempt to replace slate without experience, as the tiles are heavy, expensive, and easily damaged during the installation process. Time: Some spot repairs may be left for warmer weather, but heavy spot damage or a full roof replacement are high priority. Make sure you have the time to do the repairs if you plan to make this a DIY project, as you do not wish to suffer further weather damage before you can complete the repairs. In the event you cannot have the roof repaired immediately, tarpaulins may be used to provide some minor, short-term protection from storms until you can begin repairs. You have a few different options for affecting repairs, depending upon the results of your insurance claim, extent of damage, and personal ability. Considering these options before embarking on the repairs may save you both time and money under some circumstances. DIY Project: Best reserved for spot repairs on asphalt roofs, affecting the repairs yourself can save on costs, but requires a bigger time investment. Hiring a Roofer: With a little shopping around, a certified roofing professional may prove the best option for repairing extensive damage or damaged slate roofs. Additionally, they may save you money in the long run if time is a vital factor in the repairs. Full Roof Replacement: In the event your insurer has recommended replacing the entire roof, you may wish to consider various newer roofing materials. This is especially useful when your home has a more expensive roof covering than necessary.